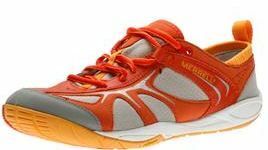 Merrell Shoes are known for being one of the preeminent outdoor brands in the shoe industry. The featured concept for the Merrell Spring/Summer 2012 offering is their new Barefoot Collection. The technology behind the Barefoot Collection allows you to build greater strength and unleash the power of your natural stride. Walkingonacloud.ca carries a large selection of Merrell footwear for men and women from the Barefoot Collection. The Dash Glove is a super comfortable lace up shoe made of synthetic leather and mesh. It features an integrated microfiber and mesh lining treated with Aegis® – an antimicrobial solution that keeps your feet cool and dry. You can run or walk long distances with the durable Vibram® Dash Glove sole and the stability of the compression molded EVA footframe. The Pace Glovefeatures a breathable Microfiber air mesh upper. The Merrell Omni-Fit™ lacing system provides a precise, glove-like fit for all day comfort. Its fused rubber toe bumper and synthetic leather rear foot sling provide ultimate stability and durability. The non-removable microfiber footbed treated with Aegis® antimicrobial solution resists odor. A 1mm forefoot shock absorption plate maintains forefoot flexibility and protects the foot by distributing pressure. The Vibram® Trail Glove Sole with Rubber compound provides shock absorbency and comfort. The Road Glove is another comfortable casual men’s shoe boasting superior flexibility and comfort through the Barefoot system. Feet are kept at an ideal foot climate with a breathable upper, and an Aegis®-treated microfiber footbed to fight foot odor. A durable and shock absorbing outsole from Vibram completes an excellent walking shoe, equipped to keep feet feeling great. The Bare Access is a comfortable and stylish casual men’s shoe from Merrell featuring the Barefoot technology. The unique use of this technology in the Bare Access allows the shoes to be worn with or without socks, while maintaining a high level of comfort. The synthetic, mesh upper is breathable and light for all-day comfort. The Bare Access lining is treated with Aegis® antimicrobial, which will keep feet cool and dry. The footbed provides cushioning and support, while the rubber outsole is durable and shock absorbent to support joints. Previous PostPrevious Get Happy Feet with Alegria Shoes at Walking on a Cloud. Next PostNext Walking On A Cloud’s Barefoot Collection is On Sale Now!